Entering the North Vancouver doors of Thomas Haas brings a crush to the heart. There is a painful abundance of all manners of desire here, a beautiful bounty that embodies yearning at its best. It is a fretful journey to this location: many items sell out quickly - croissants included - and it is sound advice to simply enjoy what remains. Quarters are cramped, the patrons are pushy, but the payoff is good. Though many have pointed to their almond croissant as evidence of a higher power, we dutifully ordered the plain butter croissant. Butteriness: 5 out of 5. 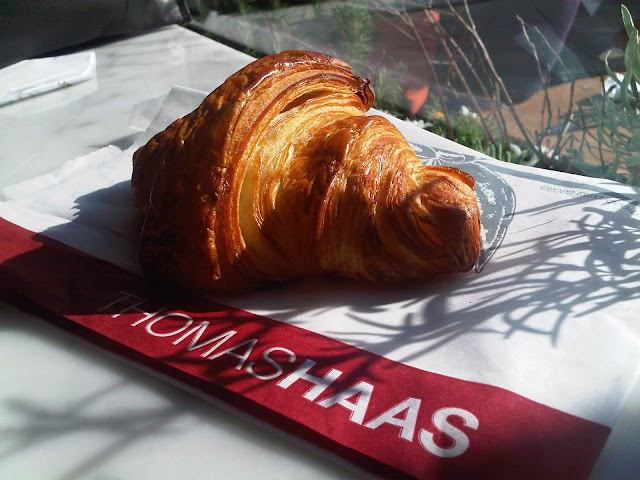 If French cuisine owes its fame to butter, the Thomas Haas croissant is butter's indentured servant. Herme has stated that one should taste the butter in a croissant over its sugar, and this croissant leaves little doubt. The greater miracle, however, is its exterior, which is not nearly as greasy as one would assume. Flakiness: 5 out of 5. When you tear Thomas Haas' croissant apart, it's not the sound that enraptures as much as it's the layers. There is layer upon beautiful layer, almost like a wood grain, detailed enough for one to count. It's this that makes you forget all other croissants that came prior, and this that will make Thomas Haas' croissant extremely difficult to beat. Lightness: 4.5 to 4.75 out of 5. It takes all the self-control in the world not to inhale this croissant, and there will be little else that one will want to eat afterwards. This might help prolong its wonder; it also might be because it's so filling. (5) bake them fresh throughout the day and not at 2 am in the morning. And then do that over and over again day by day. A giant chocolate Obelix may stare down at you while you order, but Ganache brings a modicum of restraint compared to Thomas Haas' reckless abandon. Though their cakes are a kind of delirium all its own, there are only so many hours wherein one can legitimately partake, and relatively fewer tiny bites - madelines, pate de fruits and the like - that are generally relegated to the forgotten shelf at the side. Though Ganache may be better known for its cakes (and its wedding cakes, in particular), it does offer a limited number of croissants on the weekend. 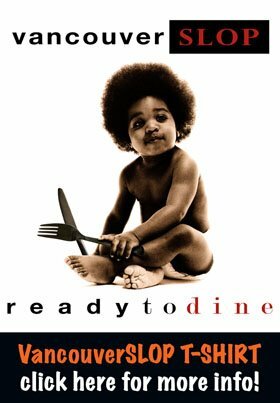 They are guaranteed to sell out during the limited weekend hours, which do not start early enough to allow one to avoid the weekend crowds. Butteriness: 4 out of 5. Though Ganache's croissant hits an obvious buttery high, it manages to taste less buttery than the Thomas Haas croissant while having a more greasy exterior. But butter is butter, and it's all here in its glory. Flakiness: 4 out of 5. To be fair, we bought our Ganache croissant around 3pm, four hours after the patisserie opened. Herme considers the croissant's shelf life to be five to six hours tops, and Ganache keeps their croissants under a glass dome. Add a short walk home in a paper bag, and the croissant is still quite crisp, though it's not surprising that its delicate flakes might have collapsed a little. Lightness: 4.5 out of 5. Despite falling a smidgen behind the Thomas Haas croissant in the other two categories, the Ganache croissant is still a little cloud of delight. Like everything we make at Ganache, we make the croissants from scratch, by hand, in house, and bake them fresh every morning. Our croissants are made with butter only, both in the dough itself and in laminating the layers of dough. 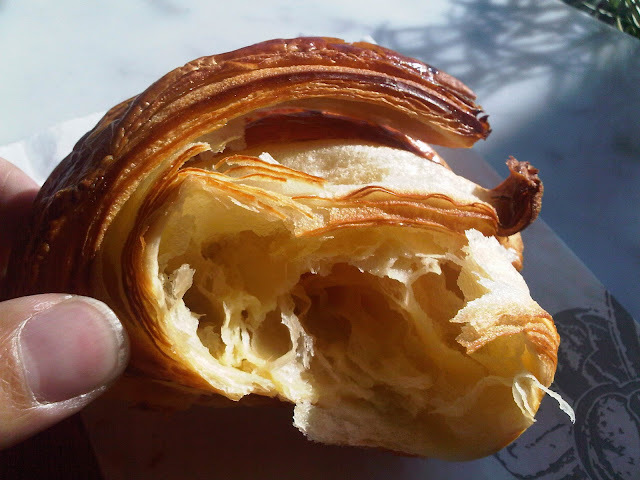 What I think makes our croissants so good is the buttery flavour and it's light and airy texture which can be seen when you bite into it and see all the pockets of air within the dough's structure. Hey Joe: How about creating a table or leaderboard of sorts of the scores/price to help us keep track? I am just gonna wait till you're done and see who's on top ... and will hit the top ones! I suppose I haven't thought of creating a table/leaderboard under the assumption - however misguided - that a few people might actually like to read each review. Maybe they don't. Either way, it'll probably have to wait until the end of it all. I can't wait to consume 5/5 butteriness! Crunch crunch crunch. You NEED to have Thomas Haas Double Almond Croissant!!! AMAZING!! !